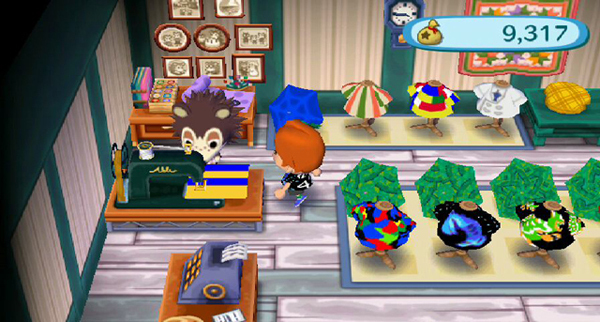 In AC:WW, there are several story-lines that you can hear about: Sable from the Ables shop, Tom Nook from the Nook's store and Blathers from the Museum. This guide is purely for those that want to know what happens on a day to day basis with each character. To do this, you must talk to this character everyday straight. Missing a day will make you have to start from Day 1 again. Note: All pictures have been taken in AC:CF for good quality pictures. As well, all dates are examples and may not be right. Try to talk to these characters everyday. Just like AC:CF, AC:WW follows the same "schedule" for Sable. Tom: 'Pshew!! Oh, mercy, I must offer my apologies! What can I do for you, hm? Tom: ...Young (your name here)...I bet you think...that all I think about is money and how to make more of it, hm? Don't you? Tom: Well, perhaps you're right...But I'm absolutely, 100% OK with that, hm? Indeed! I like to think that it's my job to show you young people how hard life is! As an adult, it's my responsibility. It's my TRUE job, if you will, hm? Tom: Hmm...Oh my, how very rude. Please accept my apology. What do you need, hum? Tom: I know that I look like the very embodiment of a successful businessman...In my youth, however, I had my share of terrible mistakes, you know! Tom: Yes, yes, that was a rough time for me...Accidents and mistakes are difficult to get over, hm? Yes, I lost more than just money. I lost a friend...Worst of all, my passion faded, and that is a thing no man can live without...Listen up, (your name here). 'Easy' moneymaking schemes are NEVER easy, hm? If such a deal should present itself to you, I'd advise a quick retreat! Tom: Ohhhh...Oh, I'm awfully sorry! I was...Well, never mind. What can I do for you, hm? Tom: My point is, (your name here)...This town is laid-back and easy to live in. Life in the city is completely different...It's a scary place, yes? It's a place where, unless you have money, no one will give you the time of day...It's just as they say, hm? A concrete jungle! Tom: Oh, mercy...Whoops! How very forgetful of me, yes? What can I do for you, hm? Tom: I wonder, (your name here)...Do you know...the number-one reason friends become enemies? Tom: Well... It all starts with a small loan between pals. No matter how much you trust some one...you should never let a friend borrow money, hm? Unless you're willing to loan it to them assuming you'll never get it back. If a friend approaches you asking for help, you must be firm and say no! Tom: It sounds callous, but no! The longer you live, the more you'll understand...Even the most solid friendships become fragile when money is involved, hm? This is something that I learned firsthand when I was young. It's the truth! Tom: Grrrumph...Oh, I'm most awfully sorry! Please, I insist you tell me what I can do for you, yes? Tom: Yes, yes, it lives on, but I know better now...You can't live off of dreams alone, hm? In the end, what really matters is money...I know it's depressing, but it's the truth. Tom: Oh, I'm so very sorry! I started getting carried away, there, hm? I should know that a youth like you doesn't want to hear about MY youth...Yes, yes, I'm not going to talk about it anymore! If you would do me a personal favor and forget I ever said anything, hm? Tom: Oh boy...Ah, please forgive me. What brings you here to my establishment, hm? You: AHHH ha ha ha! Tom: Well, I never! How very rude of you! You may not believe this, since it's not incredibly obvious to the naked eye...But I trim my hair every day, hm? Without fail! And on top of that, depending on how I feel that day, I customize it! Now, perhaps it might be a little too subtle for most people, but...That's how I express myself! It's where I let it all hang out, as they say, hm? Don't think I've not tried alternatives! This is the only style that suits me! Tom: Oh me...Oh my! I couldn't be more sorry! What is it you need from me, hm? Tom: (Your name here), it's all right to ask you something, yes? Do you happen to know what a 'petriperm' is? You: Uh, a rock band? Tom: Uh, no, I don't believe so. The other day, Harriet came up to me and said...'Nook, I bet you'd look absolutely scrumptious in a petriperm!' Well, (your name here)? ...What do you think? A 'petriperm'??? Tom: I have no idea either, hm? When she asked me, I got panicky and said...'Oh, yes, yes, a petriperm. I had those all the time when I was younger! '...Yes, yes, a blatant lie. I acted like I knew what it was, yes? Harriet just laughed...'Petriperm! Petriperm... What in the world could that mean, hm?' Ugh... Thinking about it is sure to steal sleep from me tonight! Tom: Oh dear. Oh dear, terribly sorry. Forgive my woolgathering. Can I help you, hm? Tom: Well...You remember that word that had us stumped, yes? I finally figured it out! I now know precisely what a 'petriperm' is! Tom: Yes, yes, I'll tell you! A 'petriperm' is......simply a shortened version of the term 'petrified perm'! You: Ah ha ha ha! Tom: It's no laughing matter, hm? Do you even know what a petrified perm is? They take a very skinny curling iron and give you very tight curls, yes? The curls are firm as rock! Why, if I did that, I'd look like a circus clown! I'd be the laughing stock of town, hm? They'd ask where my red nose was! Ugh...How mortifying, hm? The very thought makes me feel such humiliation...That Harriet...She probably knew I'd feel this way. That must be why she was laughing, hm? Ugh! I swear, I will never again play the fool for some big-city girl! Tom: Phew...That certainly was a time...Oh, but I'm terribly sorry! How can I help you, hm? Tom: ...Well, actually, I was just thinking about the good old days, hm? I know it seems that the world is my oyster, what with my fine shop... But in my childhood, I lived the kind of life you couldn't even imagine! Tom: Yes, yes, but this was all some time ago, before I moved to this town, hm? Of course, I was born in our lovely Asgard, but I moved away for a time...Yes, yes, the city years I like to call them. I was a raccoon of action, hm? The big city certainly had its charms... but it had its pitfalls, as well. Indeed, I had to endure certain hardships that I've never spoken of, hm?...Hard to believe, yes? You're probably asking yourself, what the heck is Nook talking about, hm? For now, (your name here), maybe it's best that we forget we ever talked about this. Tom: Oh me, oh my...Oh, I must apologize, hm? Forgive this humble Nook! What can I do for you? Tom: The other day, after I told you a little about my past, young (your name here)...I started thinking more and more about the days of my youth, hm? Tom: ...Actually, I think you hit the nail on the head! Yes, yes, right on it! I don't know what's come over me. I'm a businessman first and foremost...I shouldn't let my mind wander while working, hm? Work is work, and Bells are Bells...And the world can be a cold, cruel place! Tom: Oh, an optimist, hm? Well, well, (your name here)...I expected you to be more cynical than that, hm? Tell me, have you ever in your life joined the work force? It's brutal! The working world is a tough place...Definitely dog eat dog, hm? Let your guard down, and before you know it, the Man's got you pinned! No matter how grand your dreams are or how lofty your goals become...In the end, in this world, money is everything, hm?...Dreams alone aren't enough to make your belly full, no! Tom: Whoops! My apologies! What is it that I can do for you, hm? Tom: (Your name here), I'd like to apologize for acting so self-important days ago...I think I may have eaten something that disagreed with me, yes? Tom: ...Yes, yes, (your name here)...I already mentioned to you that I'd spent some of my youth in the city, yes? To be honest, there's a bitter memory that I have of that time...I haven't quite come to terms with it, you see...May I tell you about it? Tom: Yes, yes, thanks much! You see, I had visions of success in the big city...Such visions led me from Asgard and into the cold arms of the city. Soon after I arrived, I discovered metropolitan life to be difficult...I was most unprepared, yes? And soon, it was one error after another for me...Yes, yes, i lost everything.I gathered my few meager possessions and slunk home. Yes, city life was rough...Savage and wild...But all was not dire, hm? Because I experienced the despair of rock-bottom...I was able to push myself to become the success that I am now, yes? Tom: Oh, mercy! I'm so sorry! What brings you here? Some shopping, yes? Tom: Yes, yes, (your name here)...I've already shared much with your already, hm? At this point, I'd thank you much if you could hear me out to the end, yes? You: Lay it on me! Tom: No, I was wrong, and I got worse. I had a friend who was my biggest supporter...We grew up together, hm? She wasn't what you would call a verbose girl, but...She was the first to tell me that I could never give up on my dreams. But I...One day I...I turned to her and said these words: 'Dreams are nothing in the face of money!' She turned her back on me. From that day on, we were never the same again, hm? The strange thing is, her words of encouragement... are still with me today. Blathers: No, no, pay me no mind. I believe I'm just a touch on the drowsy side... If you think about it, I keep this place open day and night, 24 hours... It's no lovely park stroll! Rather a ferocious work schedule, eh wot? Blathers: But then, it is my duty, so I try not to admit fatigue or clamour for vacation. And if you care to know a bit of a naughty secret, when the museum is empty...I go downstairs for a cup of coffee and a wee break, hoo! Oh, such naughtiness! Ah. Yes. Hoo. Indeed. Delectable...All this talking has got me thinking about how simply glorious a cup would taste! That bitter aroma that hits you as soon as you set foot in the shop...Hoo! Indeed, hootie hoo! A cup of java would truly hit the spot, wot wot! Blathers: Well, I've been dealing with a rather nasty bit of insomnia lately...Could I perhaps have been drinking too much coffee? Blathers: 'Hoo. Yes. You have a point. In coffee, there is a substance called caffeine...And in caffeine, there are stimulants which awaken your senses, wot wot! That said, my usual is a heady blend which includes Brewster's special...... 'Pigeon Milk!' Just brilliant stuff, that! It counteracts stimulants and actually relaxes, wot! Yes. Indeed. Hoo. Ultimately, the subtle yin and yang of the two give me balance! Hoo? I beg your pardon? You think that means...They cancel each other out? So it wouldn't matter if I drank it or not? Hoo. Yes. Ah. Hm. Indeed. Why on earth AM I drinking that stuff, anyway? Blathers: Well, Brewster and I met in a town far from here...in my hometown, in fact...'Twas on the outskirts of downtown, in the shadows of its towering skyscrapers...He owned and operated a cafe, much like the one in this museum, wot wot! Brewster: 'There's nothing more bitter or tragic than a rushed cup of coffee.' Just a simple comment, really. But it struck me to the very core, wot! It cut through the pall of anger and opened my eyes to what I was doing. Making coffee is more than just pouring water over grounds, you see. It's about taking one's time to coax the flavor from the savory beans...A thesis is the same way. He taught me that my brain was like his coffee beans! Yes. Hoo. You've guessed it. That barrister was none other than Brewster himself, wot! And that is how our long and deep-rooted friendship began! Hootie hoo! 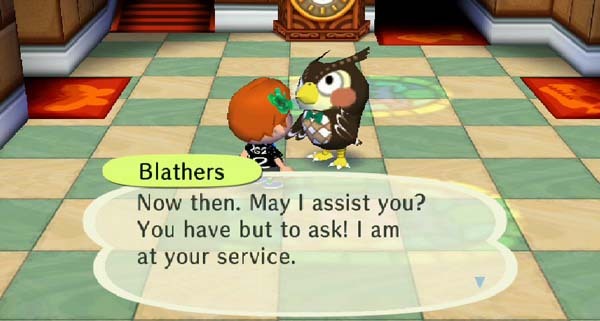 Blathers: Yes. Hoo. I was thinking about Brewster, who owns the cafe downstairs. Well, when he lived in my hometown, he had a bit of a rough life, you see...Compared to this town, it was a gargantuan city, and you know big-city life...Land was savagely expensive, and taxes astronomical......and dear Brewster was having a hard time making ends meet at the shop! Blathers: Well...I was just mulling over how Brewster used to be, once upon a time. It's in the past, so I think it's fine for me to share that he had it rough. Blathers: Poor thing, indeed! Hoo! 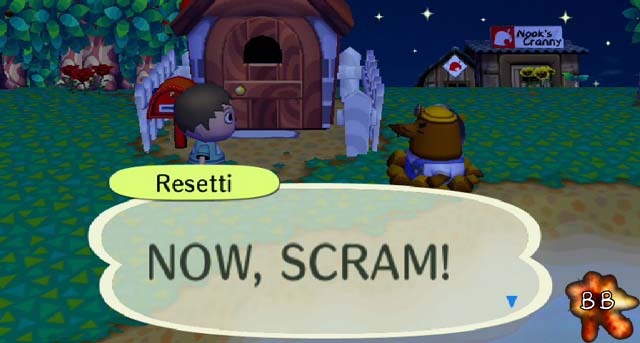 When I got wind of dear Brewster's predicament...Why, I knew I had to do something! I promptly dashed off a letter...I offered him one of the museum's rooms, free of charge, of course...But only if he agreed to move to your town name, start a new shop and a new life! Blathers: ...Indeed! You can see what he thought of the idea! And business is booming! Oh, you can't swing a net in the city without hitting a coffee shop nowadays......but in your town name, it's still a bit of a rare treat, eh wot? I should say so! That pigeon loves coffee more than life itself, and he shares that love! Indeed, Brewster is what I would call a luminary of luscious lattes, wot! Blathers: No, not as such...You see, one day, my professor approached me with an idea. He spoke of plans in the offing to build a museum in this town. They were having a most difficult time filling the curator position...'Twas my understanding that no one from the main Faraway Museum would move...And sadly, they were unable to fill the position with local talent...So, they asked the person heading up the project to find a good fit, wot! And that good fit was none other than yours truly! And so it went, hoo! Blathers: Yes. Well, the timing was perfect...I'd just received my curator's license, and before I knew it, I was the newest resident of dear old your town name! And the rest, as they say, is history, wot wot! Don't misunderstand, it's not as though I regret moving here! Not one jot! It's just that I can't help but get a wee bit nostalgic at times! Mr. Resetti is a short-tempered mole who appears in all of the Animal Crossing games. He will give a long boring lecture if the power is turned off without saving or the "RESET" button is hit, brandishing his pick-axe as he does. The first time he meets you, you will be thanked and yelled at. I believe in saving, and you really don't wanna mess with him. He will taunt you, and try to get you as mad as possible. The only way to avoid him is to SAVE SAVE SAVE!!! Yeah, so uh, hello there. You and me...we met before? At the museum, somethin' like that? I guess I oughta thank you for buying this game, Animal Crossing: Wild World. Uh... What was next, again? I ain't recitin' that stupid line again! Let's get down to business, whaddaya say? You an' me gotta talk a bit here. I gotta let you in on why I've come to visit. You followin' me, bright eyes? You do anythin' unusual, maybe? Like...I dunno, you turned off the power without savin'? Huh? I didn't hear whatcha said there. ...You did? You quit without savin'? Don't tell me, I'll tell YOU, pal! If you're gonna turn the power off, you gotta save first! Didn't old man Nook do his routine on how you can save in the attic? If that's too much work, you even got START right there...lazy bones! Yeah! I gotta tunnel out here and lecture you! Got it? Good! Don't forget! So tell me somethin': you even know what resettin' does to your play time? All that time you spent playin'? Maybe it was just a minute of your life. What do I know, right? Well, I'll TELL you what this mole knows: you gotta treasure life. And don't even talk to me about other games, neither. This is Animal Crossing: Wild World. We...encourage you NOT to do stuff like that. Hey, I know what you're thinkin'. "This is MY game. I can do whatever I want!" Look, I hear ya, pal, loud an' clear, but we got rules here. Did I explain that slow enough for you? Yeah? Seein' as this is your first offense, I'm gonna let you off easy this time, OK? But you oughta know, kid, I'm goin' outta my way to be friendly here. Normally, well...I got some anger-management issues. I was born with a short fuse, and that thing gets shorter every single day. I don't try to be mean or scary or nothin', but some people are real sensitive. Pfff... I'm just tryin' to scratch out a livin' here. I ain't a goblin, y'know? But, hey, fear and loathin' comes with the hard hat, so...BOOOOOO! BAH HA HA HA HA HA HA HA! ...Yeesh! Look at the time! Here's hopin' I don't have to come see you no more. I gotta talk to you again, punk, an' I'm gonna be wearin' my angry hat. It is one ugly hat, too. You'll get straight-up, high-octane, mad mole! No cream, no sugar, punk! Hold it right there, punk! What did you do? Huh? What am I talkin' about? Huh? Don't you play dumb with me! Before you turn the power off, SAVE! I KNOW you knew that! Don't even lie to me! I get lights and sirens playin' and electric mambo at HQ! Well, clean out your ears, [name]. You're gonna gimme health problems, punk. ...OK, listen, everybody, and I mean everybody, makes mistakes. And maybe you didn't plan to do this. Maybe this is all a big misunderstandin'. It don't make a clod of difference. Think about it, will ya? What, you wanna fix all the things that go wrong? You wanna snap your fingers and erase your screw-ups? I mean, pssshh, I wish I hadn't dropped outta dental school. I REALLY wish I hadn't washed my white boxers with my red sweatshirt...BUT! Is turnin' the power off without savin' gonna change any of that? ...Of course it ain't, punk! That kinda thing only happens in video games! In REAL life, in the REAL world, it ain't happenin'. And that's normal. Hear me? That's the way it is, right? It's takin' whatever comes your way, the good AND the bad, that gives life flavor. It's all that stuff rolled together that makes life worth livin'. Turnin' the power off 'cause you didn't get an item you really, really wanted? Or tryin' to backtrack and avoid some kinda sticky situation? I mean, grow up, will ya? You know anybody who's got a perfect life? Mistakes and disappointment make the sweet things in life that much sweeter. You gotta take everythin' life throws atcha. Roll with the punches, hear me? Deal with the consequences of your actions, 'cause life ain't no video game. You feel that irony, punk? What's with the face, punk? You think I need that look? You got that how-long's-this-guy-gonna-keep-yappin'-at-me face. Yeah. Well, wipe it off, ingrate! You're lucky I ain't MORE mad, you dirty resetter! All this tunnelin' and barkin's got me beat. I'm done with you, kid. You'll SAVE before you turn the power off! SAAAAAVE! Wash your hands after you go to the bathroom! What? What's in your head? You think I wouldn't notice? You think I'd let it slide? SAVE before you turn the power off! SAVE! What don't you understand? AAAARGH! YOU! You're a real piece of work, you know that, kid? What is it you're tryin' to do to me here? Don't you know I got high blood pressure and chronic tunnel toe? My doc tells me I gotta take it easy, try not to get too worked up. Do I LOOK not worked up? No! All this chasin' you around's gonna do me in. You're doin' this on purpose, ain't you? Yeah! Why don'tcha just toilet-paper my cave while you're at it, you little punk! Don't you kids ever LISTEN? You wouldn't believe what I gotta do to stay healthy. Lately I've been tryin' to make yogurt from scratch! The scary part is havin' to taste-test it. You ever try spicy meatball yogurt? You gonna stop messin' with me, [name]? All you had to do was say "OK"! You're pushin' the wrong buttons, kid. The big, red, angry buttons. You ain't takin' this seriously. Worse, you ain't takin' ME seriously! Kids today, no clue what you're thinkin'. You got alien brains or somethin'. You're all mouth and no heart, you know that? You're laughin' at me right now, aren't ya? Yeah, I see. I got your number, punk. I'm tired of wastin' my time. I'm gonna go watch some TV. One of my favorite movies is on: "A Few Good Moles." All right, set me up with a little "you-know-what" and I'll hit the tunnel. There's no way you don't know. I KNOW you know! I ain't buyin' it, punk. I know you got somethin'. What? I ain't askin' for all your cash! I don't need a full meal! Just a side order, no big deal, know what I mean? Look, I know you got somethin'. I hear them pockets jinglin'! What's the hold up, punk? It's not like I'm muggin' you over here. You forget how to talk? Tippin' against your moral fiber? You don't wanna listen to me no more? You tired of talkin' to me? Huh? You done it now, punk! You WILL learn to save before you turn the power off. You got yourself on the bad side of a bad mole on a bad day, punk! You're gonna regret this for the rest of your life, you resettin' cheater! When you take a bath, try usin' some soap, stinky! You know how many people I gotta repeat myself to? How many times I gotta tell you that? Are you maybe turnin' the power off without savin' for laughs? You wanna get the crazy mole out here an' see what he says next, that it? Ah-HA! I saw that, kid! You rolled your eyes at me! You DO think this is a joke! Y'know, I been with the Reset Intervention Bureau since the family took over. I gotta say, though, I ain't NEVER had to deal with a nutjob like you. It's OK. I been trained. It just means I gotta lose the kid gloves an' get serious. I may even hit the gym and go a few rounds with my cousin, Vicious Vole Vinnie. See if you wanna keep resettin' after I bounce a couple mole elbows off ya! For the time bein', though, you get to tell me how sorry you are. Testin', testin', 1, 2, 3! Now I'm gonna give you an apology, an' you're gonna repeat it back to me. You get it wrong, I know you ain't serious, and you get to say it again! Yeah, that's a good one! Hmmm... Naw, that ain't gonna cut it neither. That wasn't from the heart. You didn't really mean it. That was just lip service. You spat on the mic, too! Guess you're gonna have to try somethin' else, punk. GOT IT! This is a good one! You ain't just playin' with me? Huh? OK. What you just said? This better be the last time, I mean it! Oh, hold on, one last thing. Brush your teeth once in a while. And don't forget to floss, too, moss-mouth! What's it gonna take to get it through your thick skull? If you're gonna quit, you gotta SAVE first! It's even written in the manual! ...You hate me, don't you? I mean, you just hate me more than anythin', right? More than laundry, traffic jams, an' bad breath all rolled together, Right? You hate me so much you can't stand it, huh? That's why you keep doin' this over an' over, right? You're tryin' to do me in. At least I know how you really feel, punk. Lemme tell you, though, you ain't the only one with feelin's here. We clear? An' today's the day I put a stop to this. You listenin', you little monster? Until you can convince me you're truly an' sincerely sorry, I ain't goin' home! You an' me are gonna go round an' round an' round! First, you're gonna show me how sorry you are, and I'd better FEEL it! I don't want no smirks, eye-rolls, or nothin' like that. Oh, an' don't try lyin'. I can smell lies! Smell 'em! All you gotta do is be honest. Gimme some genuine emotion, know what I mean? You go for melodrama, you're gonna get the wrath of Resetti, you hear me? After all this, how sorry are you? ...Huh? Is that the best you can do? You SERIOUS?! You know what? You're nothin' to me. Nothin' but a thoughtless punk. I dunno, maybe you're slow. Or maybe you don't know how to express yourself. "Apologies" are a buncha words strung together, right? We use 'em to tell others that we wish we hadn't done whatever it is we did. HOW you say the words is as important as the words themselves, [name]. So you gotta show me you know HOW to say the words! Guess it'll have to do at this point. I got nothin' left over here, so I'm gonna cut you some slack. We're clear here, ain't we, [name]? You're gonna save before you quit, right? Don't be pullin' my chain here. You follow the rules an' finish your game, then you go back to your life. You go do whatever it is you do out there in your world...all right? Don't you let me down! I don't wanna talk about this no more. Hey, hold it, one last thing. Chew your food, and stop talking with your mouth full, you little piggy! Note: Starting with the sixth time you reset, the second through fifth dialogs repeat. Useful Tip: You might also talk to Resetti when he visits The Roost, the cafe in the basement of the Museum. He sometimes appears there on Sunday afternoons from 2:30 PM - 4:00 PM.